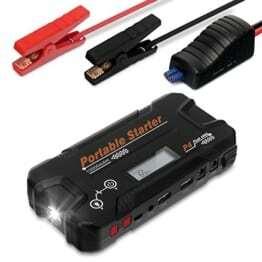 “I love these new Lithium Polymer Jump Starters! I was blown away the first time I used one and still manage to amaze myself with these things. Advance Safety of Intelligent Clamps – 1 pair of intelligent clamps enable just plug and play the booster and offer all-round protection for safe usage, and an automatic recovery in the fault state of the clamps protects your jump starter and car battery. Therefore it is always safe to use. Great Convenience for Your Needs Suaoki’s car jump starter features a big LCD display with the numeric output of battery and percentage of battery consumption, so it’s much easy to read and prevents low battery power occurs. 3 LED lights ensure your safety in case of staying in the dark, and the embedded compass leads you to the right way when you are lost in the outdoors. Note:1. 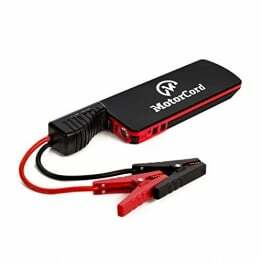 Only 5V-2.4A output, not suitable for charging electronic devices with 12V/16V/19V output.2. Please make sure the right connection of the polarity to the car battery and clamps as no protection for the clamps under manually forced start mode.